A combined outdoor classroom and stage for the village summer events. The front two panels are removable to create the full stage effect. The size of this structure made it a fantastic challenge to build. We chose a different roof structure design this time and it was the first time that we have clad an entire wall with willow (apart from the escape tunnel exit!). We know that it is being put to very good use by the whole community. All of the uprights, braces and tie beams are sections of sweet chestnut trees we coppiced ourselves. The willow was coppiced in Granchester, Cambridge and the structural timber and flooring is all pressure treated from a timber merchants. 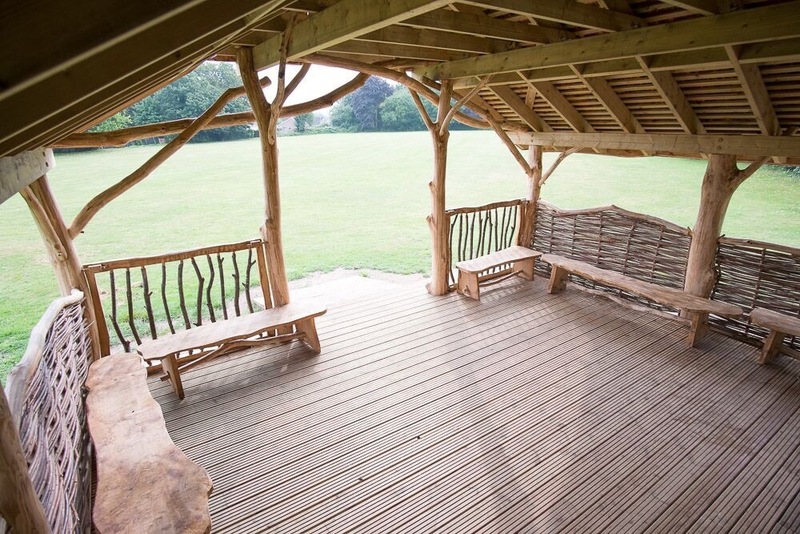 We used Canadian western red cedar roof tiles, and built the benches with sweet chestnut planked locally from a large tree felled in Norfolk. Langley Lodge, The Norman School, Northwold, Norfolk.